Please join us for our next School-Age Network Roundtable this Wednesday, April 10th, from 4-6 pm at the Children’s Aid Bronx Family Center - 1515 Southern Blvd. This is our quarterly convening of providers, parents, and community members interested in issues regarding K-12 students and their families. The event is open to the public! Please RSVP here. For any questions, please email Kendall Lewis. Children’s Aid | 1515 Southern Blvd. This is a friendly reminder about SBRT’s upcoming Roundtable convening. TODAY is our Early Years Roundtable! On April 10th, we will hold our School-Age Roundtable. Both Roundtable events will be at the Children’s Aid’s Bronx Family Center and are open to the public. For any questions, email Lara Kyriakou (Early Years Roundtable) or email Kendall Lewis (School-Age Roundtable). We are excited to share the latest news and updates from South Bronx Rising Together. This month’s newsletter includes highlights from our South Bronx Playgroup, the latest on our work in StriveTogether’s Cradle-to-Community Challenge, and details on our upcoming Roundtables! SBRT welcomes Kendall Lewis to our Backbone Team! As our School-Age Network Manager, Kendall leads projects and strategy development for our All Succeed in School work. Prior to SBRT, Kendall worked in youth development at the New Settlement Community Center and as an educator with Legal Outreach. Join us in welcoming Kendall to our community of infinite possibilities! Congratulations to the 4th grade class at C.S. 61 for their excellent school attendance! Check out this story from This Is The Bronx about their Student Attendance Assembly and partnership with Teddy’s Nissan. There was also an amazing Student Town Hall at Metropolitan High School. Congrats to all the students with perfect attendance for the month! We thank Bronx Care's Prenatal Community Health team for talking to our parents this month. We also had bubbles, Play-Doh, and tummy time! Parents and families are always invited to the South Bronx Playgroup and we encourage them to join us at our next session. If your organization is interested in speaking with or presenting to our parents, please email the Family Organizer, Arlene Rivera. Phipps Neighborhoods | 1591 Fulton Ave.
Join us at Children's Aid’s Bronx Family Center for our quarterly roundtables! The events are open to the public! For any questions, email Lara Kyriakou (Early Years Roundtable) or email Kendall Lewis (School Age Roundtable). There are numerous kids programs happening at the Morrisania Branch of The New York City Public Library this month! For more information view the calendar here. Attend a workforce event hosted by Justice Community Plus. For more information view the flyer here. Southern Boulevard Neighborhood Study - Deep Dive Meetings are happening until June. For more information view the flyer here. Phipps Neighborhoods is hosting a Bronx Financial Literacy event this month. For more information view the flyer here. 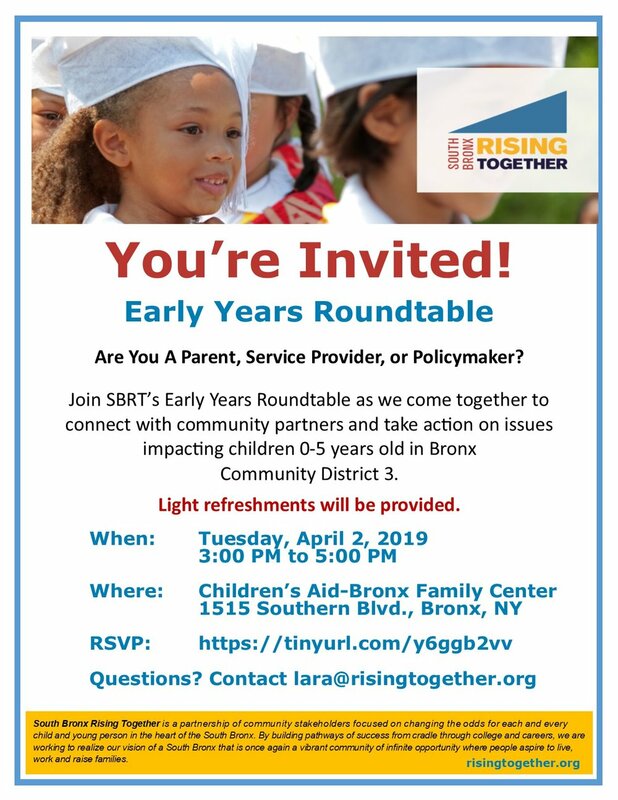 Please join us for our next Early Years Roundtable on Tuesday, April 2nd, from 3-5 pm at the Children’s Aid Bronx Family Center - 1515 Southern Blvd. This is our quarterly convening of providers, parents, and community members interested in issues regarding children age 0-5 and their families. The event is open to the public! Please RSVP here. For any questions, email Lara Kyriakou. We are excited to announce that StriveTogether has named South Bronx Rising Together one of its newest Accelerator Fund grantees! StriveTogether is a national nonprofit working to bring communities together around data to make decisions and improve results for kids. The Accelerator Fund recognizes collective impact partnerships that are poised to drive improvement in K-12 academic outcomes within their local communities. We thank StriveTogether for their generous support! To learn more about our strategy and how you can get involved, we invite you to join us at our School-Age Roundtable this Wednesday, Jan 30th. We are excited to invite you to our first School-Age Network Roundtable on Wednesday, January 30th! The School-Age Network Roundtable is a quarterly, cross sector convening of stakeholders interested in supporting the success of students and schools in Bronx Community District 3. The Roundtable is a forum for discussion, feedback, and learning how we can increase educational performance and academic outcomes in the South Bronx. The School-Age Roundtable is open to the public because collective impact cannot happen without community voice and leadership. We will announce an exciting new initiative to accelerate K-12 academic outcomes in the South Bronx! Come out and learn how to become a partner in this work! Our Early Grade Reading committee will share updates on their plans - including a sneak peek at their revised 3rd Grade ELA toolkit. Are you interested in a beautification or arts project for your school or CBO? Hear from Groundswell: a NYC-based arts and social justice organization. Click here to see some of their murals and other projects. SBRT is now part of the Healthy and Here campaign! At the Roundtable, we would love to hear about your aspirational health and wellness goals, as well as the challenges you have experienced. Join the conversation about contributing to our Bronx culture of health and learn about one persistent difficulty our neighborhoods face: asthma. With an eye towards the 100th day of school, what have you experienced and learned in your school community so far? We will have breakout groups where our communities of practitioners share their successes and challenges in grade gains, student attendance, family engagement, and health and wellness. Our next Early Years Roundtable is this Tuesday, January 15th from 2-4 pm at the Bronx Family Center! This is our quarterly convening of providers, parents, and community members who are interested in issues concerning children 0-5 years old and their families. We can't wait to see you! If you have any questions or concerns please email Lara Kyriakou. As the year comes to a close, I want to personally thank you for all your contributions to the South Bronx Rising Together network and community. Since I’ve started with SBRT seven months ago, the thing I’ve come to appreciate the most about our partners is their unwavering, deeply held belief that our community is resilient, striving, and engaged. At CAN meetings, recent Roundtables, and in one-on-one conversations, the SBRT network affirmed again and again the existing strengths of our students and families. Your conviction and work has personally impacted me and given me the greatest lesson to take into the new year: relationships matter. Data-driven strategies drive our efforts to change population-level outcomes, but we rely on individual relationships to inspire and create real change in our community. We must stay connected to residents and engage our community members in a deep and meaningful way. Access to early education is vital to a strong academic beginning for our children! Is your organization or program recruiting for 3-K, UPK, or Kindergarten slots? Click here to let us know how we can support your efforts. The South Bronx Playgroup in launching! On January 19th and 26th, we are having focus groups with parents and caregivers of children ages 0-3. Food and incentives will be provided. If you have families or community partners we should reach out to, please email our Family Organizer, Arlene Rivera. Our K-12 work is expanding! We are looking to support schools and students in Crotona Park East, Melrose, and Morrisania improve outcomes in student attendance, early grade literacy, middle school math, and college readiness. We’ll be making an exciting announcement about this work in late January. In the meantime, if you would like to partner with us to help move these indicators, email me. Happy New Year and see you all in 2019!